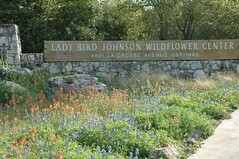 I took the family out to the Lady Bird Johnson Wildflower Center yesterday. I had a great time taking photos with my new Nikon D70. We fit in quite nicely with all the other families toting young ones and cameras. Near the front entrance, we ran into a wedding party taking photographs by a pro with tripod and extra lighting.